For those users may not want to bother with the presence of the Google Chrome logo look new. But unlike the case with Google's own party are reportedly now instead are touting the re-design the Chrome logo. 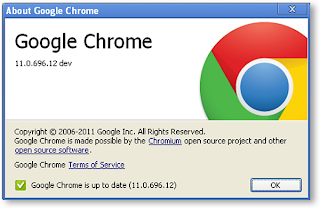 The presence of logos of Chrome is currently only available in the channel with Chrome developer version 11.0.696.12. As with the new Chrome logo may likely be used on all versions of Chrome more stable in the future. Like what is told by Steve Rura as one of the designers at Google, some of the initial release of Chrome users may have noticed the latest tweak of the Chrome icon. Since Chrome is widely known and used by many people, his attempt to reinvigorate the existence of the Chrome icon to represent that sentiment. The simplicity of this new icon is a reflection of the manifestation of the spirit of Chrome itself that make the web faster, lighter and easier for all. While Google's own party stated that so far Google has involved users and observers in expressing the design of Chrome is a new logo. And even after the Chrome Web Store Logo formally introduced a year ago, looked more Chrome logo looks like the new than the old. Well, since that's when the creative team further refine the simplicity of the Chrome logo so it appears in the icon structure which is cleaner and easier to be re-created course. The existence of a new Chrome logo may have noticed over the years. Although Chrome logo looks similar to the original, but Chrome is the new logo reflects the simplicity and the design looks more smooth. The form also appear to look flat. So far, Google has also tested several variations of the new Chrome logo to find out which one best suits the desires of its users. But most current version of Chrome which is better able to work regardless of the shape and size of the logo. And the existence of the new logo is reportedly about to be carried by the presence of 11 Google Chrome Beta version that will likely appear early next week. Then how do you think yourself about the existence of this new Chrome logo, are more deserving or even more boring? Well, all passed away to your own judge.